Our web site makes it easy to work with us from your office or home. Of course, it's sometimes still necessary (or preferred) to conduct business in-person. We are easy to find. 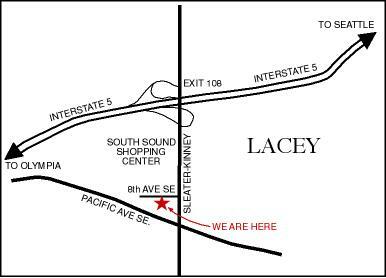 If you are in Lacey we are located on 8th Avenue just off of Sleater-Kinney. Just turn at the corner where the Heavenly Donuts is. If you are on the freeway, take exit 108 and go south on Sleater-Kinney to 8th Ave.